If your organization is already on Office 365, it makes perfect financial sense to use more of its capabilities to solve business problems like collaboration, project and team management, communication and knowledge sharing. Another advantage is that since your employees are already familiar and comfortable using Office 365 tools like email and document authoring, user adoption will not get in the way of the success of your intranet. There are dozens of non-Office 365 intranet solutions in the market that give you practically all the functionality available through Office 365. However, even some of these solutions have integrations with some Microsoft products for document authoring (Word, Excel, and PowerPoint), video conferencing (Skype), project management (Project Online), etc. Since you are already on Office 365 you can use all or few of the tools it offers, without an additional cost to do so. Since Microsoft is heavily promoting the cloud, all upgrades and updates will be completed on the cloud platforms first. So you will have an advantage over non-cloud offerings if you are on Office 365 – getting the latest features right away. Up until now, allowing employees to access the intranet from anywhere meant using VPN clients and Citrix applications which were cumbersome; or opening up your firewall and putting your security at risk. Now, with the intranet in the cloud, you are free from these IT headaches and your intranet is available at any time and from anywhere, with guaranteed uptimes and high end security. When an intranet is hosted on-site and it has a high demand for availability and speed, companies have to invest in multiple servers to handle the load and provide backup in case a server goes down. There is an enormous cost involved not only from the hardware perspective but also from a software licensing perspective. All of this is free with Office 365. No servers needed and software upgrades available at no cost. Unlike an on premise solution which can take months before you can use it, with Office 365 you go online, sign up and start the trial. You can be up and running within minutes and your users can access the intranet and reap its benefits immediately. No server installation, no software purchase, no complex configurations – fantastic cost savings! With Office 365, you can choose as many or as few of its service offerings. You can keep it very simple using just Exchange for email and OneDrive for document storage, or you can add the whole slew of tools including project server capabilities. What would have involved getting a team of experts together, haggling about features to design, documenting the requirements, preparing a plan, developing the tool and testing it before rolling it out to the staff; is now available at the click of a button. There are a number of vendors that are offering ready intranet templates built on Office 365. These not only offer a great user interface and tie all the Office 365 tools into one offering, but they also offer customization of the site with corporate branding and flexibility of placing widgets on a page. Some of them also offer added functionality like Employee Management, Forms Management and Performance Management, which may be very attractive to companies that need these tools but do not have the bandwidth to develop or purchase expensive licenses for them. 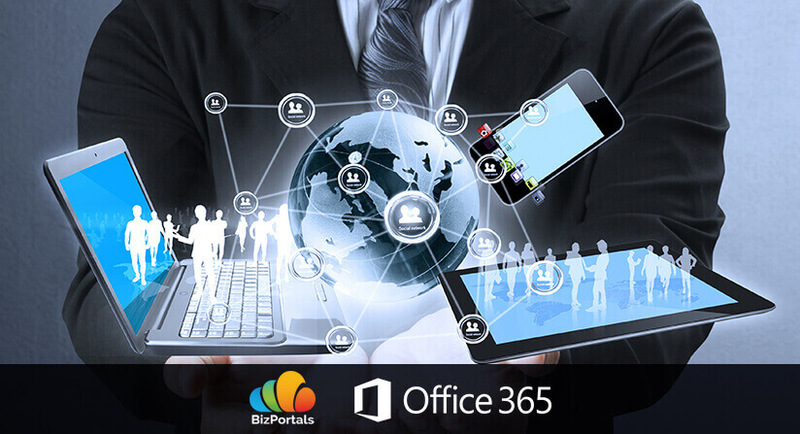 If you wish to learn more about all the Office 365 tools available to you and how you can leverage them and make your intranet successful, please email us at bizinfo@bizportals.com. We’ll be happy to help.